“My wife and I visited Monet’s garden at Giverny in 2002 and as true tourists took photographs of each other on the bridge over the lily pond. After waiting for the bridge to be more or less clear of other people I took 2 photos of my wife, one with a conventional film camera & the other with a digital camera ( these within moments of each other).On processing the pictures we were amazed to see a figure of a woman,apparently standing next to my wife, on the digital photo. What do you think? Comment and vote now! “I just wanted to bring something interesting to your attention. My boyfriend and I were at Gaudi’s Cathedral in Barcelona (Saturday 09th August 2008) and after we took the lift up to the top, we made our way down the winding stairs. Shortly before reaching the bottom, I took this photo but the figure (of what looks like a monk) in the background was not in the picture when I took it. “I’ live in the city of Santos, in Brazil. The photos were taken recently (on March 10th and 12th) by a friend of mine on a mobile phone without flash, inside the house where my father and grandfather lived years ago. My father died in 1981 and my grandfather, in 1951. The house is situated in the city of Ilhabela, state of São Paulo, Brazil, where my father, my grandfather and I were born. After my father’s death, my sister and I became owners of the house. The photos show unclear images. When the photos were taken, there was nobody inside the house, but the person who took the photo and a friend of him. They are young men, totally different from the images shown. Another photo from Tantallon Castle! “I am writing with reference to the photograph taken at Tantallon Castle which was submitted to your “Hauntings” website as part of your recent survey on ghosts. I have attached a .jpg file of a photograph (scanned) which was taken by my mother over 30 years ago. The photograph depicts myself, my brother and my late father at Tantallon Castle. At the time this was taken my mother did not see anyone, or anything, unusual in the window behind us. The figure in the window not becoming apparent until later when the photograph was developed. This image has been the subject of many long debates and discussions ever since amongst family and friends. “I am locations organiser/member of NPG-Northampton paranormal group(www.northamptonparanormal.co.uk).Think you might find this photo of interest.It was taken last year. JUNE 14 2008 AT NASEBY BATTLEFIELD-We went there on the anniversary of the battle-rumour has it that on the annivesary if conditions are right you can hear or even see the battle being replayed. Help assess the photographic evidence for ghosts. Richard Wiseman, Gordon Rutter and Caroline Watt post allegedly 'ghostly' images and invite everyone to comment. Gordon Rutter’s book presents a collection of the best 'ghostly' images from this blog. 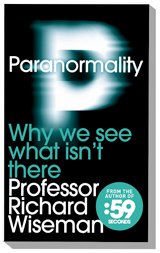 Richard Wiseman’s latest book explores the psychology of the paranormal, including ghosts and hauntings. Follow Prof Wiseman on Twitter by clicking on the image above. Do you think you have experienced a ghost? Want to submit a photograph?